This double clip device has many uses. One clip attaches to a wheelchair or walker, the other will grip canes, reachers, etc. Ergonomic hand grip. Large foot pad spreads weight. Cane pivots for greater stability. Durable Steel construction. Adjusts from 33" to 37". Weight capacity 300 lbs. 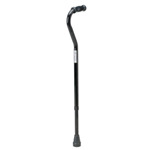 Adjustable aluminum cane (31-1/2" x 40 1/2") Weight capacity 250 lbs. 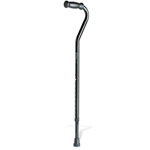 Features two easy-grip foam handles - makes it easy to sit and rise.